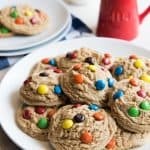 Big, Soft Baked Peanut Butter M&M Cookies are a cookie lover's dream! Classic peanut butter and chocolate combo in a perfect, jumbo sized cookie that stays super soft with a candy crunch in every bite! Combine the peanut butter and softened butter in the large bowl of an electric mixer and beat for 1-2 minutes, until light. Scrape the sides of the bowl using a rubber spatula and add the brown sugar and granulated sugar. Beat for another 1-2 minutes, until light, scraping the sides of the bowl with your spatula as needed. Add the eggs and vanilla and beat well, until everything is completely combined. Add the flour, baking powder, baking soda, and salt, then mix until combined, scraping the sides and bottom of the bowl to make sure the cookie dough doesn't have any streaks of unincorporated ingredients, but taking care not to overmix the dough. Scoop onto the parchment lined baking sheet using a 1/4 cup measuring cup or ice cream scoop. Press a handful of M&M's into the top of each cookie - enough so that there will be M&M's in each bite of cookie after baking. Bake for 11-12 minutes, until set but be sure not to overbake. The cookies will continue to set and firm up slightly as they cool even though they may look slightly underbaked straight from the oven. Transfer to a wire rack to cool completely. I actually prefer to not mix the M&M's into these cookies but only use them to decorate the tops. But you could increase your total mix-ins to 2 cups of M&M's or milk chocolate chips or a combination of the two and stir most of them into the batter before scooping, reserving some to press into the tops of the cookies, if you prefer. If making smaller cookies, decrease your baking time to 10-11 minutes.